As the DS brand points out, beyond the motor industry, three of the world's top five luxury brands are French. Why shouldn't Gallic style be equally desirable when it comes to cars? 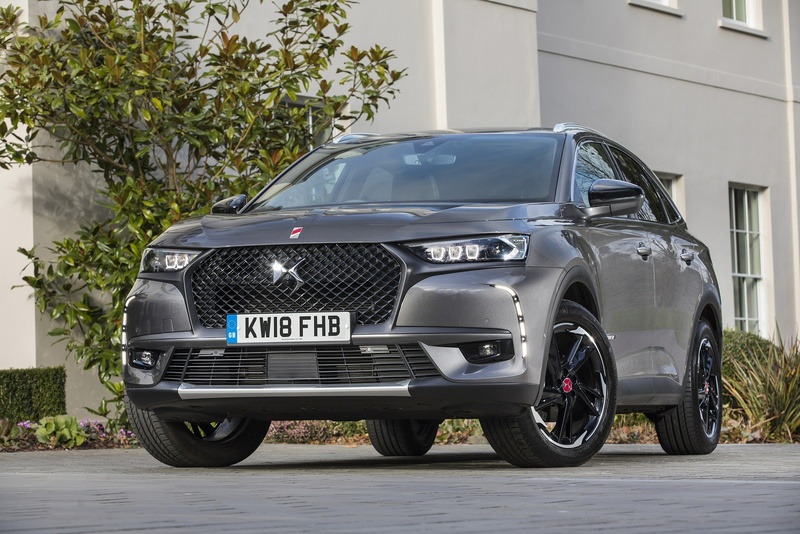 Perhaps it will be with this one, the first of the company's very own designs, the DS 7 Crossback premium mid-sized SUV. 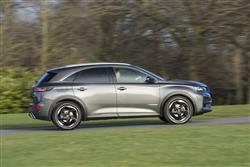 Under the skin of this DS 7 lies much that's shared with mid-sized Peugeots and Citroens, but it's all been covered with a thick sheen of Gallic gloss that could represent a refreshing alternative to the Teutonic ambiance that tends to dominate amongst premium mid-sized SUV models of this sort. There's a few signs of classic DS innovation here too. Given the marque's heritage in pioneering suspension technology, it's appropriate that the highlight is a camera-driven active damping system that sets new standards in this sector, recognising bumps and road undulations before you even reach them. Features like adaptive headlights and a 'DS Connected Pilot' package that gives you 'level 2' autonomous driving will be more familiar to buyers looking at the latest models of this kind, but this Crossback aims to set itself apart with a uniquely sumptuous, tactile interior. The idea is to bring a bit of Louis Vuitton and Chanel to the mid-sized premium segment. Like the sound of that? Then maybe you ought to join us in checking out what's on offer here. Let's put this car to the test. And on the road? 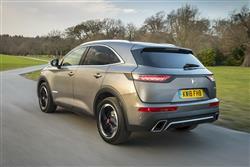 Well at last with this DS 7 Crossback model, we've got a car from this brand that rides as a DS model should. The company has a history of supple springing that goes all the way back to the original Fifties DS saloon with its ground breaking hydropneumatic suspension. 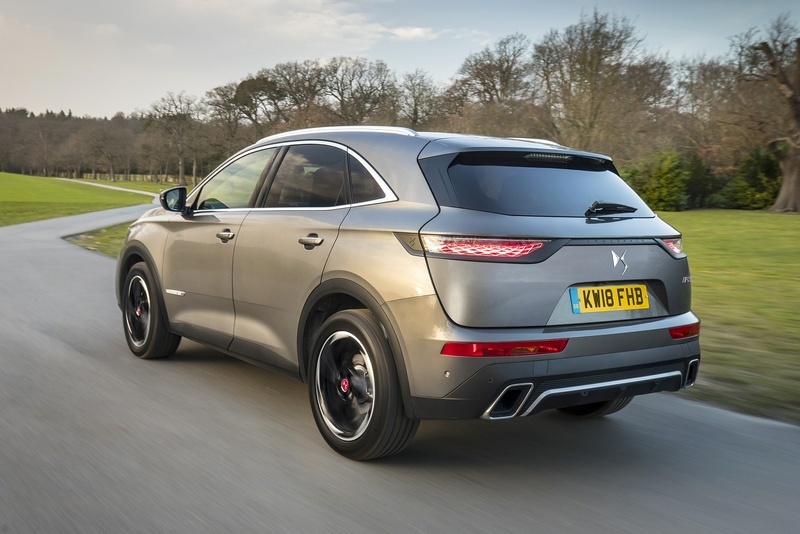 This car hasn't anything quite as complex as that, but its 'DS Active Scan' camera-driven active damping set-up does set fresh class standards, able to anticipate bumps and undulations before you even get to them, allowing the Crossback to waft over things like potholes and speed humps with silken ease. 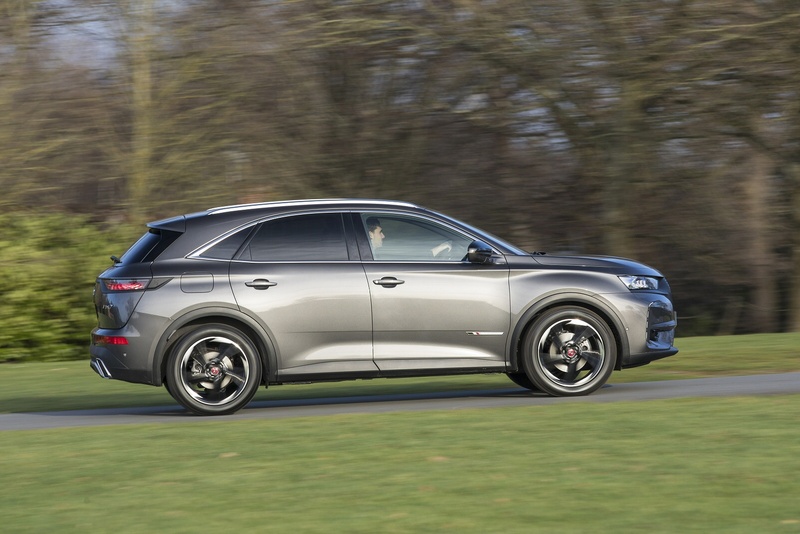 The DS 7 is at its best when you're wafting along and enjoying this Gallic model's more relaxed approach to life. Something you'll be better equipped for if, like most DS 7 buyers, you opt for the 2.0-litre BlueHDi 180 diesel powerplant we tried. Like all the conventional engines fitted to this car, it drives only through the front wheels. As for the other engines on offer, well at entry-level, there are two 130hp options, a PureTech petrol unit and a 1.5-litre BlueHDi diesel. Further up the range sit auto-orientated 'PureTech 180' and 'PureTech 225' derivatives, both of which use versions of the same 1.6 THP petrol turbo powerplant. Across the line-up, you can get an optional 'Grip Control' system that optimises front wheel grip for light off road use. The overall styling concept here isn't too dramatic, but the detailing is certainly very nicely done, particularly at the front end, the look of which was inspired by the avant garde 'DS Divine' concept car of 2014. We particularly like the exotically intricate 'DS Active Vision' LED headlamps, which emit a purple light when the car is unlocked, before pivoting by 180-degrees - in a nod to the original Fifties DS model's clever swivelling front lights. The brand saves its boldest flourishes though, for the interior, which is intended to be an extrovert celebration of everything that's cutting edge in French fashion. Alcantara, open-pore wood inlays and leather feature in copious quantities appropriate to the Parisian-themed trim package you've chosen. Even the techno-fest that must rather incongruously fit in around all of this frippery can't escape the Louis Vuitton treatment. So the super-sized 12-inch infotainment touchscreen that struggles to fit in at the top of the centre stack gets a strange barrel-style crystal-like centre volume dial. 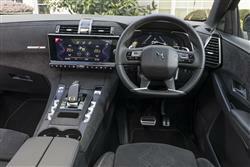 And, like the 12-inch instrument binnacle TFT monitor, can be configured via a 'DS Sensorial Drive' feature to display its information in shades of either Cashmere or Titanium. Rear seat space is good; even for a six-footer sitting behind quite a lanky front seat occupant, the legroom on offer should be quite sufficient. And there's a decently-sized 555-litre boot. 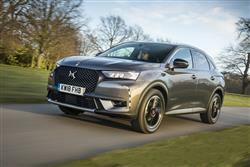 DS 7 Crossback pricing ranges from around £28,000 to nearly £45,000. 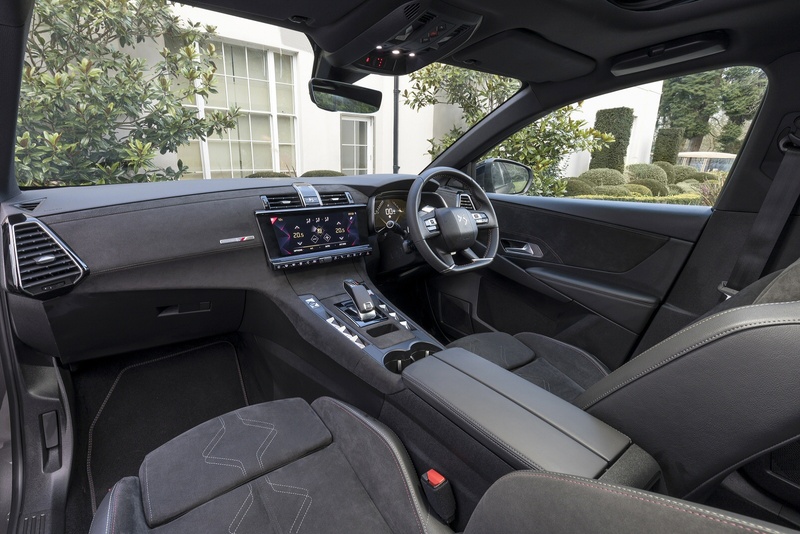 There are four trim levels - 'Elegance', 'PERFORMANCE Line', 'Prestige' and 'Ultra Prestige' - which feature four distinctly styled interior packages (DS calls then 'Inspirations'), most themed and styled around the perceived ambiance of various Parisian districts. All mainstream models come only in front-driven form. The core DS7 line-up is built around three petrol engines and two diesels. Those shopping at the bottom of the range can ask their dealer about a 130bhp 1.2-litre PureTech petrol powerplant, but are more likely to opt for the 1.5-litre BlueHDi 130 diesel unit which can only be paired with manual transmission. There are also two versions of the older-tech 1.6-litre THP petrol turbo engine that PSA Group brands have been using for some time, here badged PureTech 180 and PureTech 225, the figures designating engine outputs. A significant number of buyers though, are going to want a diesel and if they can afford to stretch beyond the 1.5-litre BlueHDi entry-level unit just mentioned, then the powerplant they're likely to want is the 2.0-litre BlueHDi 180 engine we tried - that's if they're not put off by the fact that it costs nearly £5,000 more with an equivalent level of trim. To be fair, that premium does get you automatic transmission: this top diesel unit, like the top petrol engine, has to come with a self-shifter. But it does still mean that for a mid-range 'PERFORMANCE Line' BlueHDi 180 version of this model, you'll be needing a budget in the territory of £37,000. Let's get to the exact figures that the DS 7's various engines can produce, all of which are helped by the light weight of this car's underlying EMP2 PSA Group platform. The base 1.5-litre BlueHDi 130 manual diesel model manages 68.9mpg on the combined cycle and 107g/km. To give you some extra class perspective on that, a base diesel Jaguar E-PACE delivers 60.1mpg and 124g/km. A legacy of the fact that that smaller rival model is over 350kgs heavier. With the older-tech 2.0-litre BlueHDi diesel engine we tried, this DS model's advantage over its rivals isn't quite as pronounced, but it's still impressive given the size and interior space on offer. With this variant, 57.6mpg on the combined cycle and 128g/km of CO2 is possible. The petrol models also put in a strong showing, especially the three cylinder 1.2-litre entry-level PureTech 130 variant, which manages over 50mpg on the combined cycle and under 120g/km of CO2. Even the top PureTech 225 petrol turbo variant delivers 48.7mpg on the combined cycle and 134g/km - not bad for a high performance automatic luxury mid-sized SUV capable of over 140mph. What else? Well, there's the usual unremarkable three year/60,000-mile warranty and service intervals are every year or every 20,000 miles with normal usage or every year or 12,500 miles if the car is regularly driven in an arduous conditions. If you�re looking for a new DS 7 1.6 PureTech Ultra Prestige 5dr EAT8 Petrol Hatchback for sale, you�ve come to the right place. At Bristol Street Motors we don�t just have the best DS 7 1.6 PureTech Ultra Prestige 5dr EAT8 Petrol Hatchback deals, we also offer friendly advice and help with all your enquiries to ensure your buying experience is a happy experience.